A federally funded study has found sausages sold in grocery stores in several provinces contain meat not declared on the label. The research, conducted by a team at the University of Guelph and commissioned by the Canadian Food Inspection Agency, looked at 100 sausages collected from grocery stores in three locations in Ontario, Quebec and Western Canada. All were labelled as a single type of meat. The study found that 14 per cent of sausages sampled contained meats that weren’t on the label. “This demonstrates a breakdown in traceability and if you have a breakdown, you have potential risk for food safety,” said lead author Robert Hanner, an associate professor with the Biodiversity Institute of Ontario at the University of Guelph. Hanner conducted a similar study two years ago that found 20 per cent of sausages sampled had been mislabelled. “It’s a positive story in that it is trending in the right direction,” Hanner said of the latest findings. The team looked for beef, pork, chicken, turkey, horse, sheep and goat in the sausages. In five beef sausage samples, for instance, researchers found sheep meat actually made up more than one per cent of the sausage. “This is not trace carryover,” Hanner said, adding that his team also found trace levels of sheep in 27 other samples. Four of the beef sausages that contained sheep also had pork, and one contained chicken, the study found. All of the beef sausages contained the meat declared on the label as the predominant ingredient in the sausage, the research noted. 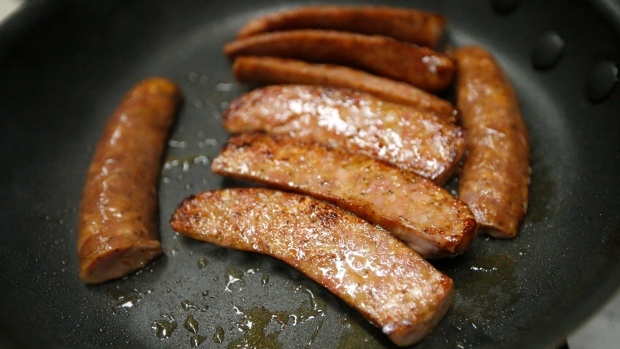 Among the 20 chicken sausages sampled, the study found one was predominantly made up of beef. Another was also made up largely of beef, with 20 per cent turkey and less than five per cent chicken. One turkey sausage likely contained bison meant, the study found. There weren’t any unlabeled species in the pork sausages. The latest findings — published in the journal Food Research International — have food safety recall repercussions, the researcher said. “If we have an E. coli-tainted batch of beef, we’ll recall that beef, but if it’s finding its way into pork products and things we don’t know it’s in, we can’t recall them,” he said. Hanner said the CFIA took “follow-up actions” after his last study, but doesn’t know what they were. The CFIA did not immediately respond to questions but has applauded Hanner’s team on his cutting edge research that uses DNA barcoding technology among other methods to figure out what’s inside the sausages. “Scientific innovation helps protect Canada’s food supply on many levels, and DNA barcoding plays a key role through species identification,” agency’s deputy chief food safety officer, Dr. Aline Dimitri said in a statement.